The powerful DEVITA RITM 30 device has been upgraded from the previous version and now has 30 pre-installed programmes, instead of 13. 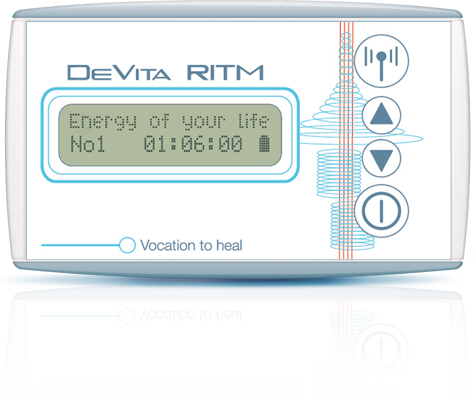 The DEVITA RITM 30 works by correcting and restoring the basic functions of the body when it is exposed to low-energy electromagnetic vibrations, working in frequency ranges of 0.1 Hz to 100 Hz. The device works quietly and painlessly with over 1,650 separate frequencies, working on the principle of resonant frequencies to subtly restore the normal functioning of organs and systems, while at the same time detoxifying. These created frequencies are in perfect harmony with the body’s natural frequencies and are not harmful in any way. The DEVITA RITM 30 is an electromagnetic device that is a unique development in the field of preventative medicine without medications, as well as in the energy balancing of the body. The most important advantage of the DEVITA RITM 30 is that it is easily programmable using the DEINFO USB stick with over 1,500 programmes. From these, it is possible to create AUTOMATED programmes so that at the press of the button the device will run a sequence of programmes over many hours, then switch off by itself. It is also so simple to use by simply pressing the ON/OFF button followed by the START button – that’s it! The DEVITA RITM 30 has been well accepted by the Ministry of Healthcare of the Russian Federation and has passed all the required clinical trials and testing in over 100 medical establishments in Russia. It also has a CE certification for safety throughout Europe. The difference between the DEVITA RITM 30 and the DEVITA AP 30, is that the DEVITA RITM 30 is for upregulating and balancing organ and physiological systems of the body, while the DEVITA AP is specifically for eradicating parasites, bacteria, fungi and viruses. Check out a short video describing the DEVITA RITM to get a better understanding of its functions. Here is a list of the 30 pre-installed programmes on the DEVITA RITM with the time that it take each programme to run. Warning! Bioresonance devices are contraindicated for use by women in the first trimester of pregnancy and by people who undergone an organ transplantation. In addition, it is not recommended to use the device within the first two months after suffering a myocardial infarction. In case of suffering from serious heart disease, the device must be positioned no closer than 0.5 metres from the body.